NO GOOGLE PICTURES HERE; ALL OF THESE PICTURES ARE FROM THE ACTUAL CAR. 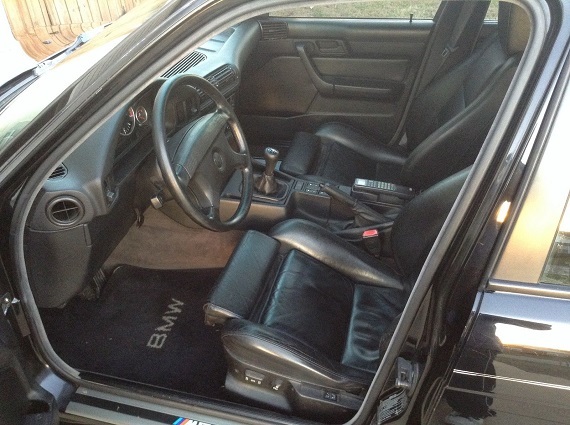 EXTREMELY RARE, HANDBUILT AT GARCHING GERMANY, I AM OFFERING TO YOU THIS ONE OF 1600 IMPORTED TO USA 1991 BMW E34 M5 SEDAN IN HIGHLY DESIRABLE GLANZSCHWARZ PAINT WITH BLACK LEATHER INTERIOR. HAS ALWAYS BEEN PROPERLY MAINTAINED AND SERVICED. I HAVE THE OWNERS MANUAL, ONE KEY, BMW TOOLS AND EVERY INVOICE THROUGH BMW DEALERSHIPS; MANY INCLUDING SPECIAL ORDER PARTS FROM GERMANY. OVER 10K INVESTED OVER 13 YEARS OF RECEIPTS INVOLVING PAINT, TOP END REBUILD, SUSPENSION COMPONENTS, EXHAUST ($2500! 321 TITANIUM/STAINLESS MIX, .035 THICK WALL 2 1/2″ TRUE DUAL WITH X PIPE REMOVABLE FROM REID WASHBON EXHAUST SHOP; PLEASE GOOGLE IT AND READ THE INCREDIBLE SPECS OF THIS PRODUCT; SOUNDS AMAZING) AND INTERIOR; INCLUDING NEW SWEDE HEADLINER. THIS IS A NO EXCUSES CAR READY TO ENJOY. ENTHUSIAST OWNED AND THE PREVIOUS OWNER (THAT DID NOT WANTED TO SELL! 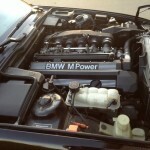 AND BOTH OF US BMW CCA MEMBERS) BROUGHT THIS CAR BACK TO LIFE. NEVER TRACKED OR ABUSED. ALWAYS GARAGED AND DRIVEN OCCASIONALLY; IN OPTIMAL WEATHER ONLY, HAS NEVER SEEN SNOW AND IT IS A 100% RUST FREE. DYNO PULLS SHOWED A CONSISTENT 278-280 WHEEL HORSE POWER (HAVE DATA SHEET) BEFORE THE CAM, EXHAUST AND CHIP WAS INSTALLED. 340HP ESTIMATED CURRENTLY. SMOOTH POWER AND TORQUE BAND EFFORTLESS DELIVERED FROM THE S38B36 UP TO 7000 RPMs. EVERYTHING ON THIS CAR HAS BEEN REPLACED, UPDATED AND IMPROVED. TOP END REBUILT/MACHINED HEAD, NEW ENGINE HARDWARE AND GASKETS, NEW ENGINE MOUNTS AND TRANSMISSION MOUNTS, NEW IGNITION PLUG AND WIRES, NEW TIMING CHAIN AND SERPENTINE BELT, NEW WATER PUMP, NEW HOSES AND EXPANSION TANK, NEW CLUTCH, NEW CONTROL ARMS AND ALL BUSHINGS AND LINKS, NEW EIBACH SPRINGS; LOWERED 1″ ALL AROUND, BILSTEIN SHOCKS, NEW DRIVE SHAFT AND SEALS, NEW HAND BUILT EXHAUST AT 40 LB OF WEIGHT !!! FROM STOCK HEADERS TO REAR TIPS WITH MAGNAFLOW CENTRAL MUFFLER AND REAR RESONATORS (CATS REMOVED); SHAVING OFF 140 LB OFF THE CAR!, LUMPY IDLE FROM THE KILLER SCHRICK CAM, NEW UUC SHORT SHIFT KIT AND SYNCHROS, NO WARNING LIGHTS, ALL CLUSTER BULBS REPLACED, BEAUTY CLUSTER RINGS, OEM 1991 TELEPHONE (UNPLUGGED), NEW ALCANTARA HEADLINER, INSIDE STILL SMELLS LIKE NEW RECARO LEATHER, NON SMOKER OWNERS, NO CUP HOLDERS PURPOSELY FOR A REASON. REPLACED FRONT FACTORY RECARO SEATS, REAR SEAT SHOWS A COUPLE OF SMALL SPLITS ON TOP, 2002 BMW Z3 BUSINESS CD STEREO TO IMPROVE SOUND QUALITY YET KEEPING INTERIOR OEM LOOK. NEW HOOD PAD, NEW ROUNDEL AND M5 EMBLEMS, HELLA EURO TAILLIGHTS AND CLEAR TURN AND SIDE MARKERS. YOKOHAMA TIRES WITHIN 5000 MILES. MOBIL 1 OIL AND MANN FILTER OIL CHANGES RELIGIOUSLY CHANGED EVERY 5000 MILES, TRANSMISSION, DIFFERENTIAL, BRAKE AND COOLANT FLUIDS ALL SERVICED. NURBURGRING PACKAGE FORGED LIGHTWEIGHT M TURBINE II STAGGERED WHEELS (REARS 17X9.5 IMPOSSIBLE TO FIND HERE IN USA) IN GREAT CONDITION. RELIGIOUSLY MAINTAINED CAR REGARDLESS OF COST. IT IS A 25 YEAR OLD CAR THAT DRIVES, SHIFTS THROUGH ALL THE GEARS, STOPS AND PERFORMS EXCELLENT, NO NOISES OR VIBRATIONS OF ANY KIND. NEW FONT ROTORS AND NEW AKEBONO ALL AROUND PADS. THERE IS A SLIGHT PLAY IN THE STEERING WHEEL BUT STILL STEERS GREAT WITHOUT HESITATIONS OR NOISES. NO OIL LEAKS. MATCHING SPARE (FRONT SIZE). ABOVE AND BEYOND RECORDS TO NEW OWNER GOES WITH THIS CAR. ONE DENT BETWEEN TRUNK AND BUMPER; NEAR KEY AREA. NEW WINDSHIELD THAT HAS A SHIRT BUTTON SIZE CHIP THAT NEVER EXPANDED. 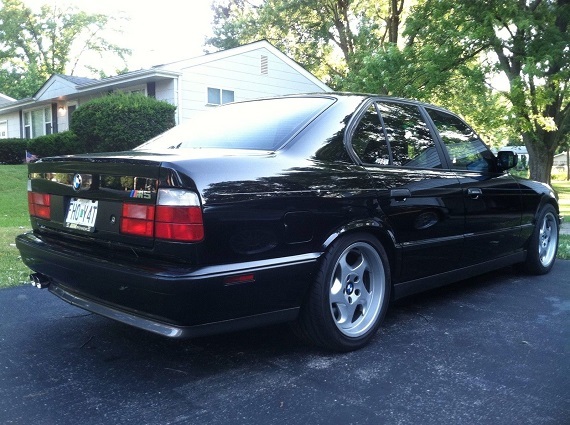 SUPERB PAINT JOB ($4100 IN 2003) USING OEM BMW SCHWARZ AND SILBER BOTTOM PAINT; WITH A COUPLE OF AREAS THAT SHOWS SLIGHT WEAR. ALL THE DOORS, TRUNK AND HOOD OPEN AND CLOSE AS THE ENTHUSIAST WORLD ONLY UNDERSTANDS. NEW BATTERY PURCHASED LAST WEEK. 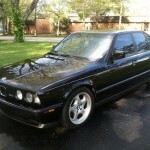 I DON’T HAVE TO SELL THIS CAR, I WILL TRY BMW FORUMS AND PANJO, BUT I WILL GIVE EBAY MEMBERS A CHANCE FIRST, THIS WEEK ONLY. 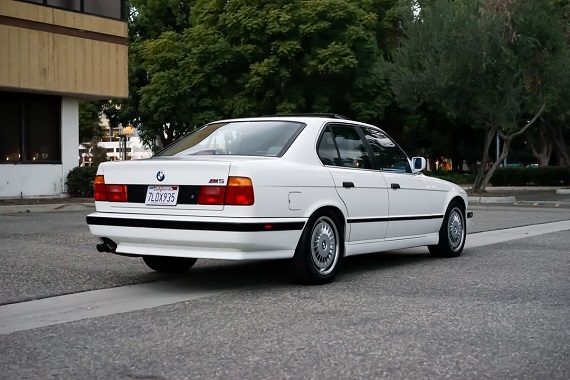 OVERALL, 9.5/10 JUST A BEAUTIFUL SOLID EXCELLENT DOCUMENTED CAR THAT REFLECTS THAT SCORE. NO CHINESE CHEAP REPRODUCTION PARTS HERE, PERIOD. CLEAN AND CLEAR LIEN FREE TITLE TO MY NAME. 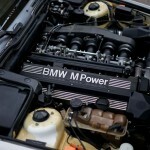 I AM LISTING THIS UNIQUE M5 WITH A VERY, VERY FAIR RESERVE PRICE SO BID CONFIDENTLY; PLEASE DO IF YOU INTEND TO BUY AND YOU ARE FINANCIALLY READY FOR PURCHASE. I HONESTLY DOUBT YOU WILL FIND ANOTHER ONE WITH THIS IMPECCABLE DOCUMENTATION. AS IS, NO WARRANTY EXPRESSED OR IMPLIED. IMMEDIATE DEPOSIT OF $1000 VIA PAYPAL REQUIRED AND BALANCE AT PICK UP WITHIN 7 DAYS OF AUCTION CLOSED DATE, WITH CASH OR CASHIERS CHECK ONLY. NO EXCEPTIONS. NO RETURNS. I CAN ASSIST WITH SHIPPING BUT BUYER IS FULLY RESPONSIBLE OF ANY TRANSPORTATION FEES. DO NOT MISS THIS CAR. GOOD LUCK!!! A true automobile enthusiast can’t own just one car. This creates the struggle in deciding which cars stay and which cars go. Unfortunately it’s time to pass this M5 on to its next owner. The combination of a S38 engine, a manual transmission, and the convenience of a sedan is a beautiful thing. 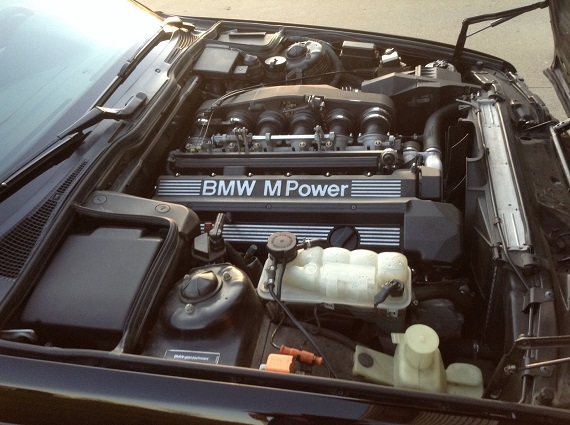 This M5 is a driver’s car. 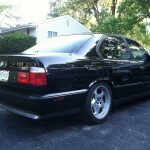 It’s clean, presentable, and well maintained but as the odometer reading shows, it’s been driven and enjoyed. Whether the new owners keeps it as a garage queen or uses it for daily driver duties, it’s up for the task. Over the past few months this car has received a large amount of maintenance that should leave it trouble free for many miles to come. 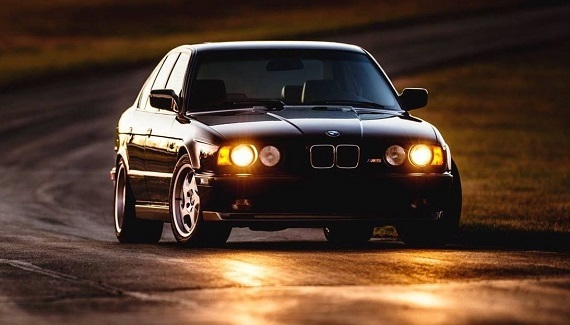 This car is completely stock and original minus the addition of the European spec M-Technic steering wheel and a back lit OEM ///M shift knob. The car runs and drives very well. The S38 engine pulls to redline happily. The transmission has recently started to occasionally grind when shifting in to 4th gear. Cosmetically the car is not perfect but it’s very presentable. The front bumper and tow hook covers are brand new original BMW pieces and have been recently painted along with the side mirrors. They are a perfect match to the factory paint. The car has rock chips in the front nose panel and a couple minor dings. All body panels are original with VIN tag photos included. 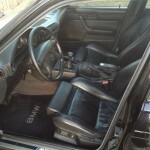 The interior is in overall clean condition but the driver’s seat does show wear due to its age. The car has air conditioning but it no longer blows cold. The front ashtray is missing in photos but will be included with the sale along with the original airbag steering wheel. Please do not hesitate to ask any questions about the car! And to get more affordable, we go within an oil change of a quarter million miles. But the condition of this car seems to be great overall – back out the heavily applied Armor All interior, and you wouldn’t guess at first glance that this car had circumnavigated the earth ten times. 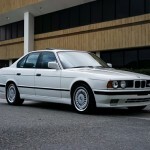 I have always liked Alpine White on the E34 M5, and the dove gray interior matches well. Bucking with most of the rest of the market, I also love the correct M-System I “turbines” more than the throwing stars that most prefer, and the polished lip on the forged wheels does away with some of the whitewall-look they’re famous for. There’s a hefty amount of maintenance performed and the seller discloses the shortfalls well. Priced pretty aggressively at $11,500, there’s room for future transmission work in the budget. The winner to me is the higher mile Alpine White example because it’s closer to stock and the color combination and configuration I’d prefer. It’s also offered at a pretty realistic price for what it is. 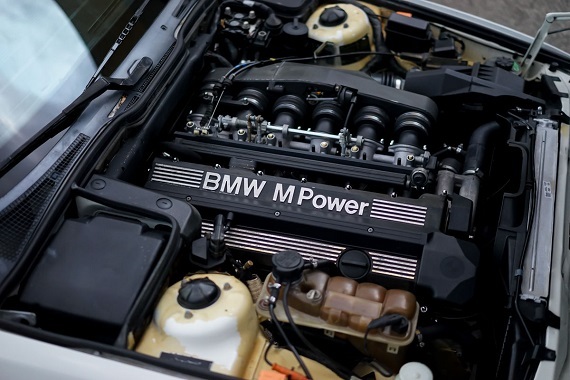 As long as a compression test didn’t reveal anything out of the ordinary, it strikes me as a good overall deal for a legendary M car. 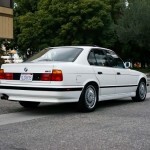 Tagged 1991, Alpine White, BMW, M System II, M-System I, m5, S38, S38B36, Throwing Stars, turbines. 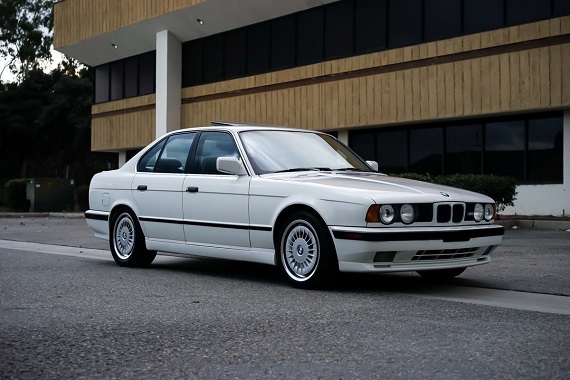 I also like Alpine white on this era of M5. Looks sharp! 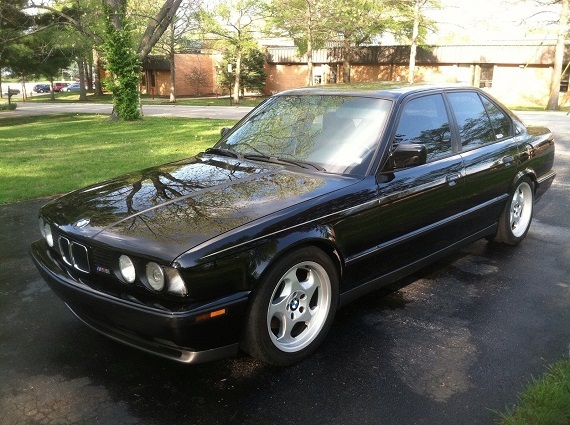 I put 298,000 miles in my E34 M5 and never had any engine work done. The motors are bullet proof if maintained (require valve adjustments every 12,000 miles). All the talk about rebuilds is nonsense. As they age, everything else does fail or leak though. I bought the black one and will picking it up next week. Fingers crossed that she still has a few more years of flogging left in her! @Patrick, good luck and hope it’s a fun-filled ownership!